CelloDad suggested checking out the Mazda 3, so off I went, cello in hand, to the Mazda dealer. The Mazda 3 comes in sedan and hatchback versions; and for the sake of climate control for the cello, I was more interested in the hatchback. This is a good-looking car, although the lines could be cleaner to my taste. At least the front has a cheerful appearance. However, as with many other cars, the bottoms of the side windows lie on a line trending up towards the back of the car; it just seems to be the unfortunate fashion right now. I went to sit on the back seat and sure enough, if I were any shorter (or an average child younger than 12 not using a booster seat), I would have to crane my neck to see the road surface in the car's lane. Meaning the bottom of the window is too high for road-trip fun. The unfortunate who has to sit behind CelloDad won't have too much leg space, either, since tall dad needs to scoot the passenger seat way back so his legs fit under the glove compartment. All in all it's pretty claustrophobic back there. In the driver's seat it's roomy enough, and everything is within reach of my short arms, always a plus. The dealer didn't have a standard-transmission hatchback on the lot (manual transmission is only "standard" outside the US), so I had to be content with trying the gear box in a 2010 sedan. I found the stick a little sticky. But perhaps it a moot point: this is one of those models where the automatic version comes with a smart, electronically controlled transmission that gets slightly better mileage than the manual version. That may explain why there are no manual-transmission examples on the dealer lot. (Also, as always, the auto version is more expensive than the one with standard transmission). 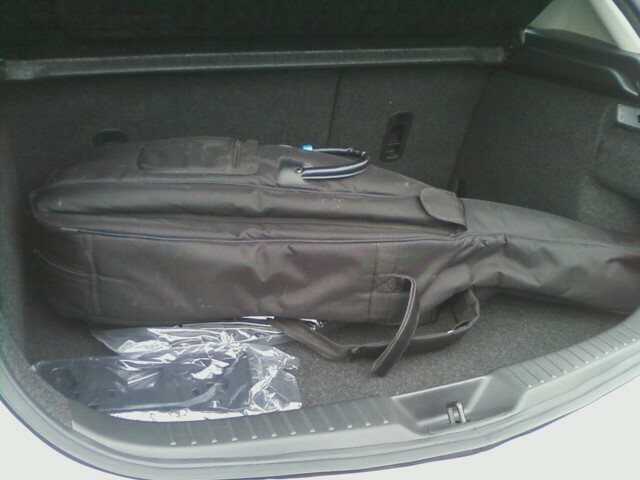 I went around to the back and stuffed the cello in the trunk. It fits exactly, thanks to a small space between the wheel well and the rear (bafflingly, only present on the right-hand side of the trunk; I'm not sure what's behind the wall on the left-hand side). Then again, this is the 3/4 cello; a full-sized cello wouldn't fit in the trunk like that. Under the hood, I would have a "choice" of two engines, both running on regular unleaded: either a 2.5L, 167hp engine (20 / 28 mpg) or one of Mazda's new(ish) SkyActiv engines, that gets a gratifyingly high fuel efficiency thanks to a larger-than-usual compression ratio in the cylinders, 12:1 in this 2.0L version (152hp, 27 / 38 mpg). Consider this: The SkyActiv engine delivers 9% less power, but gets 35% better fuel efficiency, and is $2500 cheaper than the standard 2.5L engine: why think about that choice? Here is one clear example of how going with less power under the hood saves you money both in the purchase and in the operation of the car. But if you care to look a little farther afield, you will see even better options. The Mazda 3 hatchback is sold around the world outfitted with a bewildering array of engine options, carefully tuned to the local market. In Japan, where it is called the Mazda Axela, it comes only with gasoline engines. I can see the need for offering diesels in Europe, but you wonder why they bother to keep both the 1.5L and the 1.6L gasoline engines instead of consolidating and streamlining the collection: surely the latter would result in savings in design and inventory management. As is often the case, the two versions sold in the US require the most gasoline to run, with the possible exception of the four-wheel drive 2.0L sold in the UK. And of course the sporty MPS version, called the MazdaSpeed in Japan, that delivers 263hp. This lineup really shows the attraction of diesel: the 2.2L, 183hp diesel version delivers more power than either US version at a significantly higher fuel efficiency, even compared to the SkyActiv model (which Mazda doesn't even offer in the UK). For an apples-to-apples comparison, let's consider the 1.6L gasoline engine (31 mpg, 104hp), and compare that to the 1.6L diesel version (46 mpg, 114hp), both for sale in the UK. Over the 150,000 mile lifetime of the car, you would need 1580 fewer gallons to run the diesel. At today's diesel prices of around $4.25 per gallon, that's a saving of $6700, more than the price difference of the two cars (£2,200, $3,500). Diesel in the UK costs about twice as much, so the choice there is doubly clear - especially if you factor in the fact that the diesel engine runs cleaner and therefore gets hit with a lower annual road tax. If the Mazda 3 hatchback with the 2.2L, 148hp diesel engine were made available in the US, it would cost a lot less than suggested by the UK price tag (which includes all sorts of vehicle taxes). Considering that diesel engines in general have a proven record of longevity, the diesel might just be the better option in the long run. That is to say, if the cello player is also the driver, and has no children. Then the cello can occupy the back seat; it has no need to look out of the window anyway. Emissions rating EURO 5 "E"
I’m a big fan of Mazda cars. CelloMom deserves a kudos for making such an awesome review. Just what I need, and I guess there’s nothing more than I can ask for. Thank you. I love Mazda 3. This is a great car. Drives better than anything else in its class. They just need an update on the styling. Get rid of that goofy grin. However if you get it in black it doesnt really show. Fun car to drive. True 40mpg+ hwy. Prius is﻿ not fun to drive. Like to see this as a coupe. My only concern with this one would probably be the after-purchase service and parts. I hear mazda's maintenance price might go up in the near future, so I'm just wondering how this particular model will fare with that concerned. The coveted "Zero Emissions Vehicle" label. Is a natural-gas car a cents-ible choice?